California is significantly upping the ante in its quest to get more electric cars on the road. In his final State-of-the-State address this week, Governor Jerry Brown laid out the state's ambitions for reducing greenhouse gas emissions. Then, he dropped something startling. "To meet these ambitious goals," Brown tossed out almost casually, "we’ll need five million zero-emission vehicles on the road by 2030, and we’re gonna get there, believe me." That represents a significant jump from the state's previous goal of 1.5 million by 2025, and it's nearly 15 times the number currently roaming the state -- a fact that the governor acknowledged. "We only have 350,000 today, so we all got a lot of work," he said. The number is slightly less than that, according to the climate-and-economics think tank, Next 10. Its founder, Noel Perry, says the actual the number of ZEVs in circulation in California is just above 337,000. "The sales are growing rapidly in California and we're on a very good roll," says Perry. "If we continue going the way we're going, who knows?" Perry has more than an inkling. Next 10 has been preparing a report on prospects for meeting the pre-existing 2025 goal. It was scheduled for release next week, though the governor might've just sent Perry's staff back to the drawing board. A previous analysis by Lawrence Berkeley National Laboratory concluded that to meet the state's ambitious greenhouse gas reduction goal for 2050, the majority of vehicles on the road will need to be electric. That will require not only that electric car sales continue to grow, but that the infrastructure to support them grows along with that. Brown's order includes a proposal to spur both car sales and infrastructure with a $2.5 billion investment that includes eight more years of incentives for car buyers. 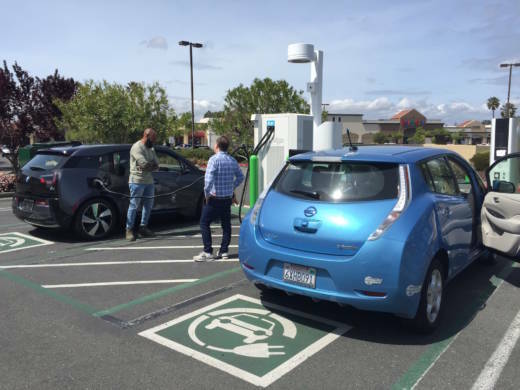 "We have lagged behind in terms of creating the number of charging stations that we need," says Perry, whose research counts 16,500 commercial and public charging stations in the state. "And although this is the most in the nation by far," notes Perry, if you look at the ratio of charging outlets per California ZEV, we're at the very, very low end." None of that has deterred Governor Brown. "California was built on dreams and perseverance," he said, "and the bolder path is still our way forward."